We’ve all known them, and perhaps also been them – the children who, when denied a toy, turned out of their favourite trike or innocently poked in the eye, see red. They (we) stamp their feet, clench their fists, scream like the Incredible Hulk on a bad morning. Eyes bulge. Hard items are thrown against walls, foreheads. Terrified neighbours peep over the hedge to see if a real-life psychiatric ward escapee has taken you hostage, just like on telly. Intervening tends to make you come away bruised and shaken, but the initial impulse is still usually to contain the child’s rage, limit the damage to the furniture and your face, keep the racket down. It’s mortifying to have your little one wig out in the queue at Safeways, and incur the glares of other shoppers whose shopping list dos not include being thwacked in the knee with a can of coconut milk by a two-year-old screaming for a lollipop. The good news, as anyone with older kids tells you, is that it’s just a phase, and they grow out of it. I think it’s largely true, but a part of me wonders if they do grow out of it, or if it just goes underground; if they learn there are better ways to express their anger, or that expressing emotion is condemned by society. My nephew is, as I hope my sister won’t mind me writing, one of those kids who is intelligent, engaged, funny, playful and creative most of the time…but there are those moments when, shall we say, you approach him at your peril. It’s getting rarer these days, as he grows out of it, or his mum learns ways of diverting the storm before it really hits full power. One of her many parenting insights has been that these conniption fits always seem to have a very basic trigger – hunger, thirst, overheating, tiredness. Recently at our parents’ house, he started getting wound up, and it looked as though he was going to hit his full, cyclonic level of peace destruction, when he – quite of his own instigation – went to the fridge and ate an avocado. Belly full, tantrum abated. Genius! His being slightly older than my own son, who is also not shy of the odd hissy fit, might be what equipped him with the initiative to get what he needed – food, and possibly even a more specific kind of food based on what his body lacked. Hey, why not credit him with as much wisdom? All this has got me thinking. Those difficult moments of childrearing, when you have a baby screaming blue murder while the toddler wees deliberately on your handbag, and the dinner’s burning and you’re about to boink yourself silly with a rolling pin out of sheer frustration (can you tell I’ve had a hard summer? ), those are the moments when enlightened parenting theories are about as much use as a frozen pea in a landslide. The tantrum (whether his or yours) always seems to have its roots in a primal need, water, blood sugar, or – though it’s not always possible, much to all our loss – another person to muck in. And it may be more subtle: a cuddle. A bit of attention. Praise. Being listened to. I freely admit that I am just as immature in my need-expression as Caveboy’s. In fact in some ways I’m worse; I sigh, roll my eyes, stare listlessly out of windows, make reproachful little comments. Those are my invisible tantrums. I dare say they are much harder to understand for the people in my life (namely, long-suffering Caveman) than a good ole yell. Knowing that tantrums, whether visible or otherwise, have as their touchpaper the most ordinary of needs makes the firestorm transparent, easier to handle, faster to quell. Though God knows I could do with remembering my own advice when Caveboy is screaming as I drag him away from a concrete mixer at lunchtime, or when, indeed, I am doing the dishes viciously, in a silent strop. Please, remind me. Keep reminding me. Just think of the innocent, defenseless crockery. 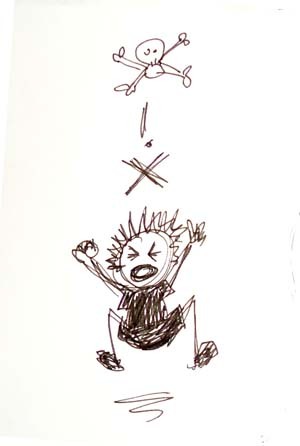 This entry was posted in Cavemothering, Funny and tagged tantrums by cavemum. Bookmark the permalink. I was on the verge of starting to scream louder then both of them when i had one of those insights… I began cuddling Eva, i lowered my tone, telling her to calm down so that her sister could sleep and i told her too that as soon as Alice fall asleep i would play with her. She finally sat on the sofa, crying lower and lower; i went with Alice to another room and … voliá: both of them fell asleep 😉 I don’t know what i would have done if they didn’t! It’s sooo difficult to stay calm in these situations! Tomorrow we’re going to the Algarve (Odeceixe) for a couple of days! Probably more if they let us to! Boy oh boy, I know that one. Sweating, house too hot even with fans on full, toddler yowling, leaping on me while I try to breastfeed baby to sleep, desperately trying to get him to understand that once she’s asleep we can play, cuddle, read stories, build a castle out of cardboard boxes…it must be so hard for them to understand but it’s also incredibly hard for the mama in the middle. Keep your head up, Marta, you’re doing great!! I can’t say I am though, I seem to end up yelling too often…although (as I was rambling on about in this post) I wonder which is better, letting the frustration out and having a good cry about it afterwards, or repressing it and simultaneously teaching the kids to repress it too. I should do a poll! What are everyone’s opinions on this one? I’m trying my best to always be ‘the rock’ for G – to be the calm ocean upon which her little boat can toss about wildly. But of course I fail! Sometimes I find it useful to voice how I’m feeling (remembering that I am running the emotions, it’s not the emotions running me as is so often the case). I tell her with gritted teeth ‘Mama is feeling ANGRY right now!’ or perhaps ‘I love you very much, and I am feeling very frustrated’. Then she learns (hopefully!) that ‘negative’ emotions can be expressed and are acceptable. It also gives her the words to be able to say herself when she is frustrated or angry rather than simply throw a fit. Dunno if it works … she’s not quite two yet so come back to me in a year and I’ll tell you how it went! She’s never had a tantrum yet… erk! Whew, I thought the summer was what was giving me grief, but it seems the juggling of two small kids (the toddler who needs more reaction, emotional balancing, and security than the baby, as well as husband and life in general has me a snapping harpie most mornings!! And much as I intend to keep the dialogue calm and reasonable, there are always those moments where the veneer of control shatters. What to do? Liver tonics? Chamomile tea? I am currently investigating superfoods and supplements which promise stress-reduction and a remedy for exhaustion…will have to blog about it soon. Haha! Yes, I believe Bosch do an elegant number in crayon-resistant granite…I do wonder sometimes if I am perhaps portraying S at his worst…am I? It’s just it’s the most gruelling moments, when you look at your life and thank ‘you really couldn’t make this up’, that always seem the most revealing. He’s adorable. As well as being a total firecracker. I doubt I would have it any other way.